When promenading around Gustav Malerplein in Zuidas, Amsterdam’s most prominent business district, passers-by are introduced to the view this image (Left). What are they going to make out of it? Well, most likely, the impression of a mainstream restaurant and shop, maybe also that of a working place. Peering through the glass facades, one immediately recognizes a large dining area on the right section of the ground floor, while more to the left, people can be spotted in front of their laptops, lounging in individual chairs or populating one of the few tables. One billboard sign just before the entrance points to the existence of a retail shop, while another one just around the corner suggests enjoying cocktails on an adjacent rooftop terrace. It may hence come to a surprise that “Circl”, built entirely according to sustainable and circular economy (CE) principles in 2015, does not only serve corporate or commercial purposes. In fact, it is actually also labelled a “public space” by the municipality and its creators and owners, the ABN Amro bank. However, there come some pitfalls with the blurring of lines between public and private and one may ask whether the tag “public” is already earned just by (technically) allowing free access, spending time inside without having any specific purpose, and hosting some admission-free events that engage with matters of citizenship at least in the wider sense? Following Jane Jacobs (1961), public spaces stimulate vibrancy and social interaction, contributing to the construction of a cohesive neighbourhood. These can be sidewalks and squares, but also schools or other places that enable ‘repeated encounters’. A certain balance between private and public spaces is necessary in Jacobs’ opinion, but they need to be clearly demarcated as either to prevent misuse. In this light, she also advocates the market and government to be separate sectors as they are based on fundamentally different value orientations. Blending them will lead to tensions and moral confusion, creating ‘a monstrous moral hybrid’ (1992). Now, given the fact that the Circl building is private property, but at the same time also meant to serve public functions, we may ask: does it deserve Jacobs’ label of questionable reputation? For any fair criticism, attention must firstly be paid to wider societal developments – specifically the broader economic changes that have made clear distinctions between public and private more and more difficult. One may perceive Circl as exemplary for the evolutionary process of a neoliberalising state in which there is a tendency towards more market-oriented urban development and a split away from the hierarchical government steering for the provision of public services. To increase the international competitiveness and ensure long-term investment, municipalities call for new planning policies that facilitate entrepreneurial activity through public-private partnerships (Van Rooy, 2011). Secondly, one also has to place the case within the specific local context. 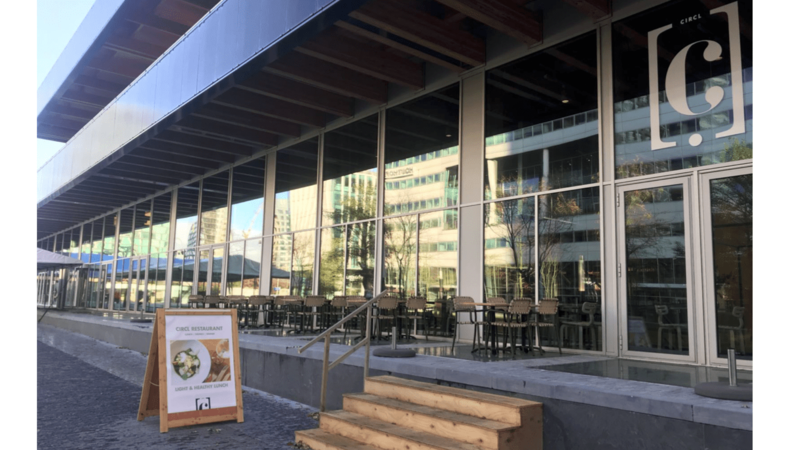 While there were indeed somewhat pure “corporate” interests of ABN Amro to tackle the lack of meeting rooms and simultaneously showcase their expertise in the trending CE sector, the municipality was also just in bare need for more public spaces in the Zuidas district. Due to the financial crisis in 2008, the former development plan of a prestigious business area was modified towards a more mixed-use approach, incorporating additional residential buildings as the demand for housing continued to be high in the popular city of Amsterdam. Hence, public spaces had to be subsequently integrated in an area that was and still is highly dominated by commercial interests – a situation which would have been classified as quite unfavourable in Jacobian eyes. Looping back to the overarching cornerstones of neoliberalism, we are perceiving a situation in which general guidelines for spatial development through land-use regulations are still set by the government to ensure long-term projections and the protection of public values, but the private sector has adopted a quite powerful position in the establishment of public policy rules and regulations. Current spatial developments as such constitute a combination of private and public interests and although the public-private role distribution is contractually agreed, its implementation in practice often moves along blurred lines of rights and responsibilities (Bergevoet, 2013). Speaking with Foucault (1982), who stated that institutional power structures are projected into the built environment, it is worth addressing how power relations between the private and public sector interest manifest within the creation of public spaces. If the municipality’s activity is reduced to stimulating and facilitating the provision of a public function in a privately-owned building, does this mean that its power, after setting the framework conditions, has ultimately been played out? Communal working space. — Images by authors. Well – on the upside, one may argue that the provision of public functions by private companies can make up for lacking resources on part of public authorities. On the downside, firstly, Circl may not be used as public space simply because it is barely recognizable as such. Commercial activities the dominant impression for passers-by and even Google Search tags it as “restaurant”. 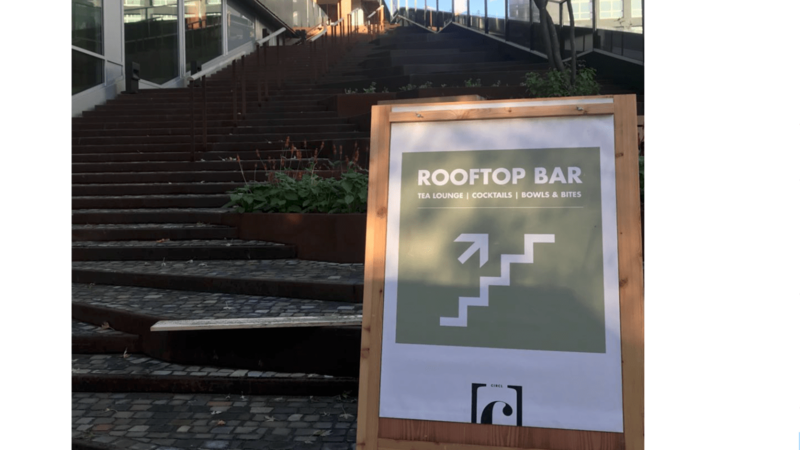 Similarly, public access to the rooftop garden is somewhat obstructed by the billboard sign indicating only a “rooftop bar”. Se condly, the high-class design of the building and the dominance of the CE topic may be intimidating to lower socio-economic or less educated fractions of the public. Although the Circl website (The Making of Circl, 2017) also states education al purposes, it remains questionably why citizens should feel encouraged to enter the building in the first place. 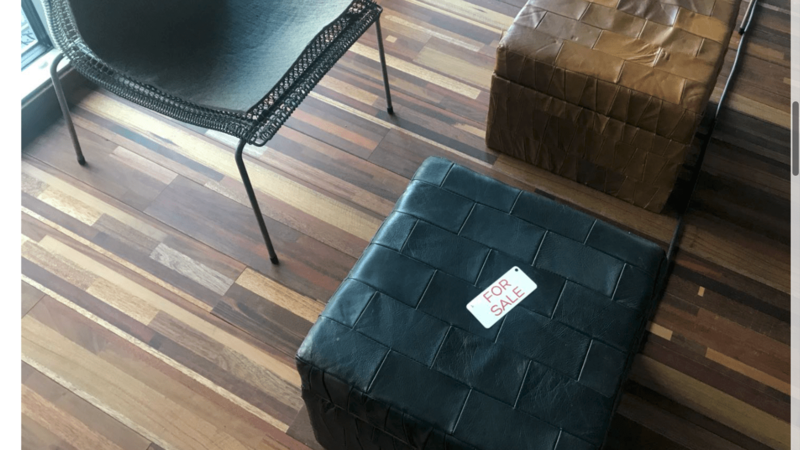 Moreover, even if they do so, the perceived dominance of economic interests will hardly be contested by the fact that the tables and chairs one can make free use of also serve as showroom models to be immediately purchased – and that for no less that 900 €. In this light, one cannot help but doubt whether Circl is apt for valuably contributing to the proclaimed municipal aim of making the benefits of the Zuidas area available to a broad and diverse target group. It is therefore highly problematic when, having facilitated the provision of public spaces by private actors, public authorities may lean back and claim to already have fulfilled their duties in creating liveable places – while in fact they have not. Apart from issues of lacking inclusivity due to social-economic and educational barriers, regulations for its use remain in the hands of the respective owner. That entails the power to restrict certain behaviour, thereby creating an atmosphere of uncertainty, or simply to close it down to the public at some point. Hence, Circl can at best be labelled a (potentially temporary) semi- public space – leaving the municipality with still owing the creation of more “true” public spaces for the citizens of Zuidas. Bergevoet, T. (2013). De flexibele stad. Oplossingen voor leegstand en krimp. NAI. Foucault, M. (1982). The subject and power. Critical inquiry, 8 (4), 777-795. American Cities, 1-25. New York: Random House. perspectief. Building business, 13 (10), 1-5. The Making of Circl. Het verhaal van een circulair paviljoen aan de Zuidas. (2017, September). Retrieved from https://circl.nl/themakingof/. 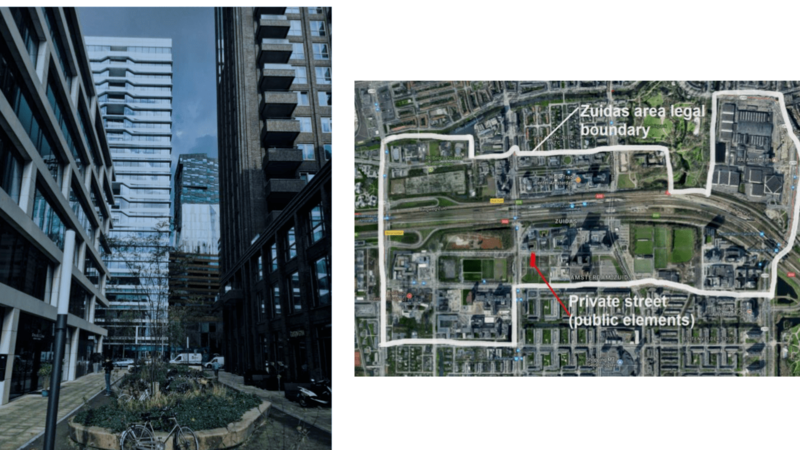 Left: Photograph of the street in this study from the south side (Site visit November 2 2017); Right: Zuidas boundary area with notation of the private street from Google Maps (Google Maps, 2017). While exploring the rapidly growing neighbourhood of Zuidas in Amsterdam, there are many unique urban design features that can be found. Taking a walk down Gustav Maherlaan towards Vrije Universiteit, will lead you to a quiet street right before Buitenvelderselaan. Why is this street so unique? Because it is a mix of both private and public ownership, as observed by personal anecdotes from some of the new businesses that can be found. Using the map below, the red color is be used to denote the exact location of this private-public area, in the greater Zuidas district. Although this street does not have a legal name, it still has the look and feel of any other street in the area. The resulting public character of this private street has been formed by neoliberal climate of the largerPPP in place (Tasan-Kok, 2012 p. 13). The following factors determine the current public character of the street. First, several landlords are involved in De Zuidas, due to top-down approach in which many private partners are involved. This street bridges two tower blocks, one which is residential, and one which is office. Both tower blocks are owned by different landlords, which rearrange residential meetings once every season (Interview Session). The ground floor businesses have only been operating in the area between one to two years, with construction still ongoing on the surrounding streets. The most important point of the argument is the lack of connectedness between the residents. 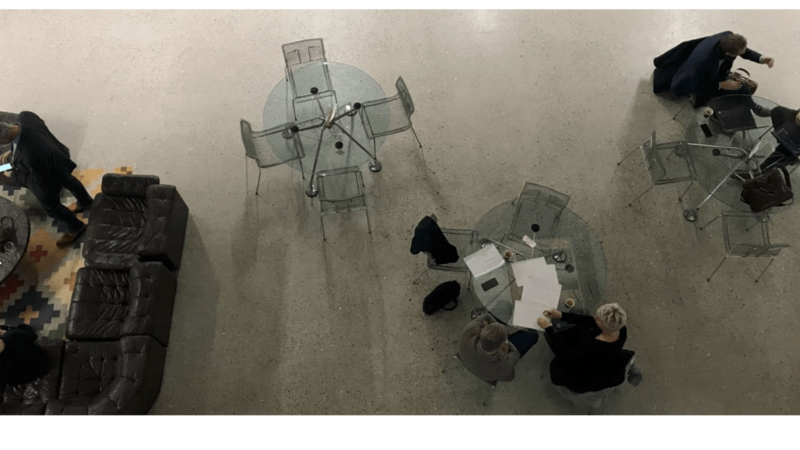 For example, a private organization, ‘James’, was asked to create more connectivity between the residents of the housing tower block (Interview Session, “Ons verhaal: 900 Mahler + James”, 2017). This assumes that neighbors do not know each other, which correlates with the stories of the hairdressers and the owner of the Japanese restaurant; there is minimal interaction between residents on the street between neighbors. Furthermore, the street must be maintained by the operating businesses and residents, except from the garbage and the weeds. It was interesting to note that two out of the three people that were interviewed were not aware about the restriction of self-maintenance (Interview Session). Derived from the conversations with these business owners, the street has a variety of characteristics that can be used to form the narrative of the larger development process in Zuidas. According to the master plan vision of Zuidas, public space is marked as a key pillar along with mobility, community and sustainability (Hello Zuidas, 2016). The interviews of business owners reveal that at first appearance, it may seem to be a regular street, but instead it is a bit more awkwardly assembled as a result of larger development-driven forces. As the development authority further completes master vision projects in this area, other similar spaces may emerge, occurring at a greater scale. The importance of evaluating PPPs at the scale of this street may seem trivial, however; this neoliberal climate can ultimately have much larger consequences such as a lack of option of an “alternative urban future”(Roy, 2015: 62). With an ongoing top-down planning approach, “blurred boundari[es]” such as this street could become more common, if more extensive consideration of public space users is not integrated. The challenge for change will be to counter the inertia of existing and future planned private-led development to ensure space for residents and other users. Campbell, H., Tait, M., Watkins, C. (2014) Is There Space for Better Planning in a Neoliberal World? Implications for Planning Practice and Theory, Journal of Planning Education and Research, 34(1) 45-59. Roy, P. (2015) Collaborative planning – A neoliberal strategy? A study of the Atlanta BeltLine, Cities, 43: 59– 68. Tasan-Kok, T. (2012) Introduction: Contradictions of neoliberal planning. In: Tasan-Kok and Baeten (eds. ), Contradictions of Neoliberal Planning: Cities, Policies, Politics. Springer: Dordrecht, pp. 1-19.